Last week’s wave of protests and attacks on U.S. embassies launched a million op-eds (along with an instantly notorious Newsweek cover) about the return of “Muslim rage,” the failure of the Arab uprisings, the collapse of Obama’s foreign policy, and the inevitability of the clash of civilizations. When a satirical French newspaper leaped forward to run some more hopefully offensive cartoons, everyone braced for another round of violent protests across the region. But a funny thing happened on the way to the apocalypose: almost nothing. There were a few tiny demonstrations, but most Arab countries (in contrast to Pakistan and Lebanon) saw no mass rallies, no burning embassies, no screaming for the television cameras. The fizzling of the protests against that awful YouTube film was obvious before today, of course. As has been widely noted, the protests last week were actually quite small — vastly inferior in size and popular inclusion to the Arab uprisings protests last year, and small even in comparison to the ongoing pro-democracy or other political demonstrations which occur on a weekly basis in many Arab countries. The killing of Chris Stevens and his colleagues, and the dramatic images of broached embassy walls and al Qaeda flags, radically inflated Western perceptions about the magnitude of the protests. 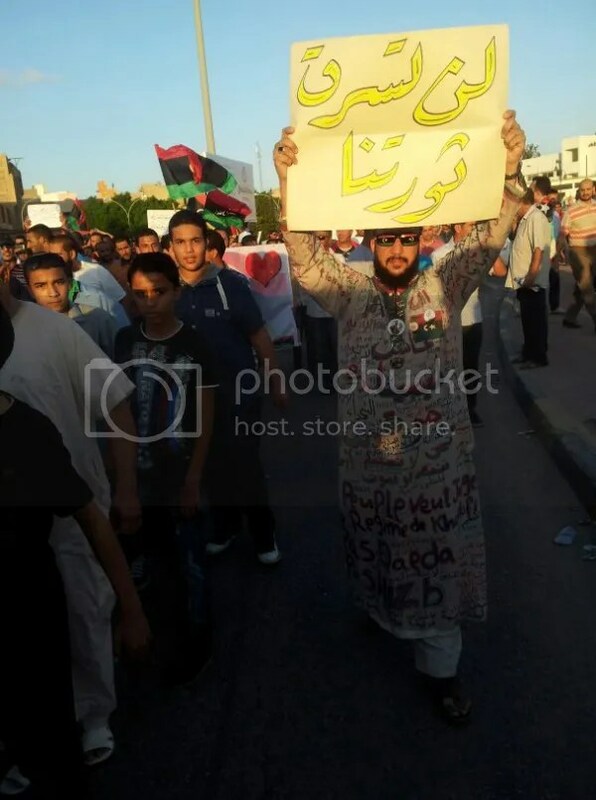 By far the biggest story of popular mobilization today came in Libya, where tens of thousands came out in Benghazi in an inspiring rally against militias and against the attack on the U.S. consulate. Thus far, millions of opeds have failed to be produced in response. That’s a pity. The failure of the Arab world to follow its assigned script really deserves as much attention as did last week’s outburst. I wish that the relative fizzle of today’s protests and today’s large rally in Benghazi denouncing the attack on the U.S. consulate and militia violence would get even one-tenth of the media attention lavished upon the supposed meaning of last week’s embassy attacks. The fizzling of the protest wave and the Benghazi counter-demonstration suggests better questions than the popular choices such as “why do they hate us” or “why are Muslims so angry” or “how badly has Obama failed.” For instance, why were these demonstrations so small? Why did they peter out so quickly when the Danish Cartoons crisis went on for months? Why did they fail to attract broad-based support outside of their core constituencies? And why have so many leaders of Arab countries in transition, Islamists included, rushed to apologize and to reassure the United States? I don’t have all the answers, but here’s a few possibilities. First, the interests of key Islamist actors at this time pushed them toward restraint rather than escalation. This is not to say that the Egyptian Muslim Brotherhood, for instance, should be seen as “moderate” (an endless, if somewhat futile, debate). There’s little reason to believe that the Egyptian Muslim Brotherhood is less keen to protest offenses to the Prophet or to create a more Islamic society now than they were six years ago. Their ideology hasn’t much changed, nor their membership, nor their willingness to take offense at perceived slights. But their interests have changed and they found themselves forced to adapt when their initial instincts backfired. As president, Mohamed Morsi has to worry about Egypt’s international alliances and reputation, not least with the United States. As the leading political party in the country, the Muslim Brotherhood’s Freedom and Justice Party needs to worry about how it is perceived in the country at large, and about competition for conservative votes from Salafi rivals. Their initial instincts were to jump on the protest bandwagon, but they were quickly forced to adapt when confronted with political and structural pressures from at home and abroad. And so they call for legal measures against blasphemy and for peaceful protests but denounce violence, make the necessary apologies, and seek to tar their Islamist rivals as irrational extremists. more, intense domestic political competition means that other political forces have little interest in allowing one Islamist trend to define the public agenda. A sign seen in Benghazi today reading “Our Revolution Will Not Be Stolen” could have stood in for the attitude across many of the region’s now well-entrenched activist communities. The dominance of the local political arena is often missed in analysis which lumps all the protests, large and small, together into a single narrative of “Muslim rage.” Almost every well-reported account of last week’s protests in particular countries emphasized the local political issues in play. In Egypt, Salafis were jockeying with Islamists for political attention, while the actual battles outside the embassy seem to have mostly involved young toughs rather than ideologues. In Yemen, general anger at U.S. policies combined with a concentration of angry young toughs seemed to be the key. In Lebanon, the greater violence in today’s protests than in most other places likely has to do with Hezbollah leader Hassan Nasrallah’s attempt to focus on religious affronts rather than his unpopular stance on Syria. Third, while I don’t think it’s a major factor, perhaps Obama’s outreach to the Muslim world hasn’t actually been the dismal failure declared in a thousand (oddly similar) opeds after all. It’s true that his Cairo speech and subsequent policies have not granted him enduring popularity or magically generated universal love for America. But that was never really the expectation or the point. The Danish cartoons protest wave was sustained by the broader international “clash of civilizations” atmosphere of the middle of that decade, a seamless narrative of conflict between Islam and the West fueled by the toxic legacies of the high rhetoric of the war on terror and the occupation of Iraq. Obama’s outreach efforts sought to break that spiral toward a clash of civilizations between Islam and the West, by focusing on issues of “mutual interest and mutual respect.” Last week showed that the extremists hoping to spark a clash of civilizations are still there. Who thought they weren’t? But their relatively poor showing suggests that something has changed. And part of that may be that even if U.S. policies remain unpopular, there’s no longer a seamless narrative of a war on Islam which makes sense to ordinary people. Of course this doesn’t mean that we won’t see more cycles of outrage and protest over these issues. A lot of people genuinely care about them, and they have the ability to organize protests, spread their message, and capture local and international media attention. Sometimes, the interests of key actors will align differently and they will gain more momentum rather than petering out. In Pakistan and Lebanon, for instance, things are far uglier than in most of the Arab countries — likely for reasons related to the domestic political situation. I eagerly await the rush of opeds and cable news talk shows sure to come soon explaining the real meaning of the relative calm in Cairo and today’s rally in Benghazi. I’m sure I’ve misread some of the cases here, and that the next week or two might lead to different dynamics playing out. But questions about these political dynamics, the failure of the mobilization to take hold into a sustained protest, the shifting calculations of key Islamist actors, and the responses by other powerful social forces in places like Libya would be far better questions to be asking than the ones which have dominated the discourse for the last week.